Women are the beautiful creature of GOD. They look even prettier when they wear tradition Bengali sharee with jewelry. And the fact is women also love to wear sharee. It’s been a tradition for a long time. Almost every occasion we see women’s wearing sharee in parties, social activity, religious festival, pahela boishakh etc. Sharees are an essential part of women’s wardrobe. Traditional women of our country love to wear sharees to celebrate every occasion. 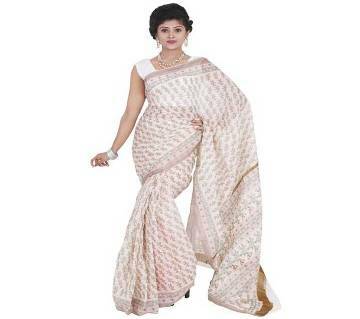 Shop from Ajkerdeal for the finest quality cotton sharees in Bangladesh; besides, there are silk, georgette, katan, jamdani, taant, kota, muslin and many more. We also collect all the new and latest Indian collection of designer sharees for your gorgeous outlook. All of the designs are up to date and you will get each and every type of sharee collection in our store. AjkerDeal is the best online marketplace where you will get the biggest sharee collection in Bangladesh. Check out our latest Eid collection of sharee. 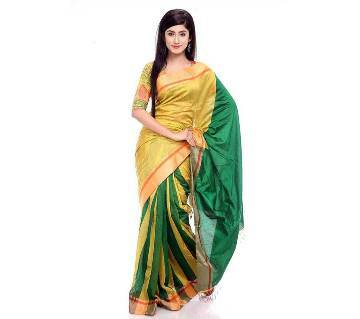 If you desire to decorate yourself with the Bengali culture, mold yourself in beautiful cotton sharees. Discover your choice from our wide collections of tangail taant, hand loom, kota, block printed, brush printed, hand-printed soft and comfortable cotton sharees. Choose from our collections of pure silk sarees includes traditional kerala silk, tussar silk, kota silk, muslin silk, dhupiyan silk and many more with all of your favorite colors. Do a style check and pick out our collections of chiffon and georgette sharees. Shop online to get all types of georgette of your favorite including pure georgette, plain georgette, and faux georgette. With an astounding variety of katan sharees, we offer benarashi katan, silk katan, georgette katan, opera katan and many more which are suitable for any occasion. Although sharees are considered as one of the most traditional outfits for women, yet sharees are available in many modern varieties as well. Sharees weave the magic of festival and fashion together. AjkerDeal upholds the core values of trust and quality in bringing all the collections of women's fashion which match with your fashion. If you are looking for the best deals on sharee price in Bangladesh, check out AjkerDeal.com to get your desired sharee from the exclusive designer sharee collection. AjkerDeal is offering lots of latest designed sharee at a discounted price the upcoming Eid festival. Also if you place an order from our mobile apps you don’t need to pay the delivery charge. Don’t waste any time and grab your desired sharee right now before the stock is unavailable. Place an order online and make your Eid more colorful with the latest designed sharee collection. Enjoy a great shopping experience with AjkerDeal.com. Happy Shopping!